Convenient, compassionate, quality healthcare available 7 days a week. No appointments or referrals are needed, just walk right in to our beautiful, newly renovated modern office. Can’t get in to see your primary care doctor? No problem, our friendly staff and highly qualified physicians are available when you are 365 days a year. Looking for a Pasadena health clinic you can trust? 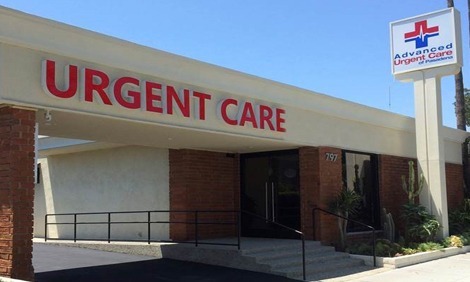 Visit Advanced Urgent Care of Pasadena. Our talented physicians are trained to provide top-quality medical assistance to patients of all ages, from infants to the elderly. Our brand new Pasadena community urgent care facility is clean, extremely kid-friendly, comfortable and open extended hours each day. Enjoy convenient on-site amenities, including a pharmacy, laboratory and digital x-rays at our walk-in clinic. Pasadena families can trust us to provide immediate care, without having to schedule an appointment or spending hours in the waiting room. At Pasadena Urgent Care, we know life isn’t always predictable. People get sick and injuries happen, so you need a community health center you can rely on. No appointments are needed for our medical clinic in Pasadena. We’re open seven day per week, with convenient extended weekday hours, including holidays. Medical facilities often feel cold and unwelcoming, making patients uncomfortable. However, at our Pasadena health clinic, we strive to offer something different. Modern, spa-like offices replace sterile exam rooms, so you can feel at ease. When you’re under the weather, you need to be in a soothing environment, not one that adds to your distress. Not only is our medical clinic in Pasadena, CA designed to provide adults with quick and convenient care ─ we also cater to kids. Our fun kid-friendly waiting room and exam room brightens their day when they’re sick or injured, helping them to relax. We understand that visiting a health clinic can be intimidating for little ones, so we do everything we can to make the experience as enjoyable as possible. If you or a loved one needs urgent care in Pasadena, CA, we’re here to help. We specialize in non-life threatening medical illnesses, by providing a wide-variety of services. Not only is our brand new facility more comfortable than an emergency room, it can also serve as a less costly and faster care alternative. Standard emergency room wait times are often at least one to three hours, while our patients are typically seen by a medical professional in 30 minutes or less. Additionally, Pasadena Urgent Care offers a level of personal service you won’t find at the ER. We don’t forget about you when you walk out the door ─ we’ll follow up with you after your visit to see how you’re doing. Staff members at our Pasadena health clinic are truly invested in our patients and want to help you recover from your illness or injury as soon as possible. You can always count on personalized and friendly service. While no one wants to be sick or injured, needing urgent care, Pasadena residents can count on us. Our talented staff is here to provide the treatment you need in a quick and convenient manner, so you can get back into your routine as soon as possible. Please Note: We take our last patient 30 minutes prior to closing.